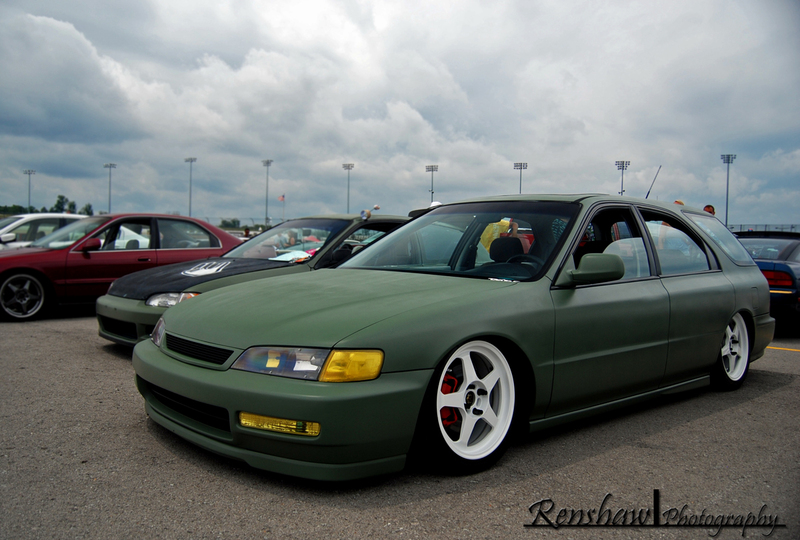 What's Your Opinion on Matte Finish Paint Jobs? The reason I ask is because after years of being left out in the cold, heat, and general bad weather, the clear coat on my Accord is failing (after 17 years). I don't have time to have the car painted properly, so I'm probably going to go with a vinyl wrap instead. So now there's creative choices. Should I just get a gloss color the same as the original? Or maybe matte? Or black? Or carbon fibre? 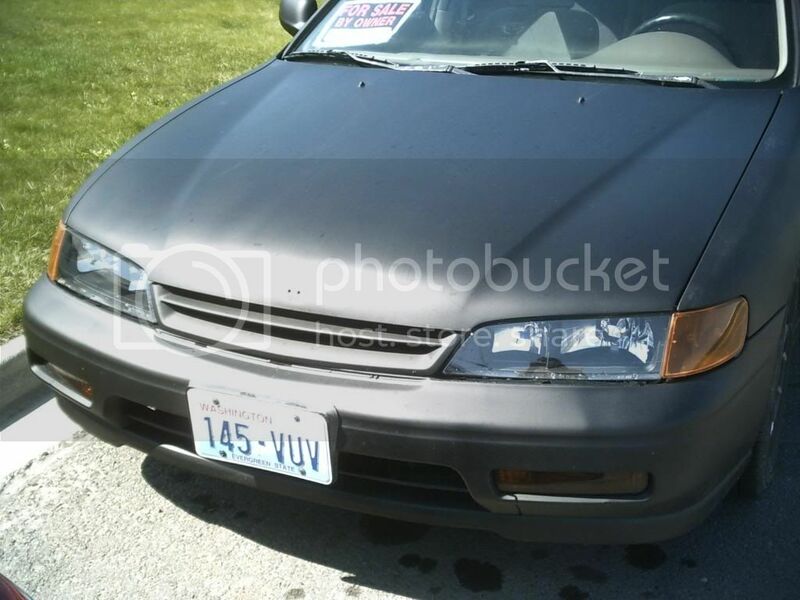 I've noticed matte finishes seem to work best on cars with sharp angles, which the cd5 Accord chassis does have, but I don't know if it would truly work. At the same time, gloss would do fine. I'll probably have the Huntsville Car Scene logo on the car too, but I'm thinking something simple versus looking like a race car since it doesn't have the exhaust or brake upgrades installed yet. 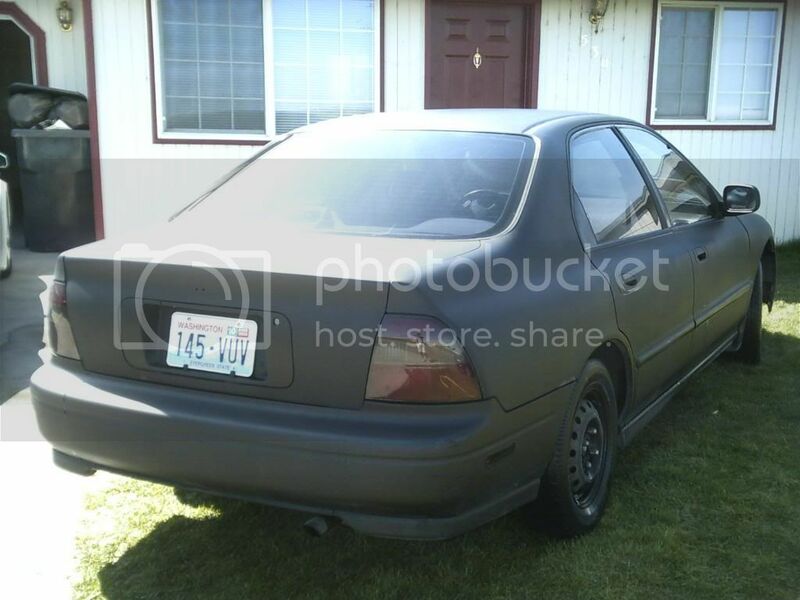 Or should it look like a race/tuner car from a European race series? A vinyl wrap is cool, but I don't think matte black can be pulled off on any car. I've seen SRT4's wrapped in matte black and to be honest, I didn't like them. Also, most wraps cost as much as painting and take just as long. (done properly) Where were you thinking of taking the car to get the vinyl put on? Exactly. And I can see this. The SRT4 has a more rounded shape, which I don't think lends itself to a matte finish. I've seen Porsche 911s in matte finish and didn't like it. I've seen a c63 AMG wrapped in matte black and it was wicked! They do, but there isn't the prep time involved in proper painting of dismantling parts of the car. And time is what I'm lacking. As far as company, remember the one where that designed the Transformers package for Brad's car? They also designed and executed the FNF2 cars that Bill Penny made and sold. They would be one of the companies. The other is in North Carolina. Clint is working with a company that just does vehicle wraps and does them for almost half the usual $2k. I need to take the car there anyway for some of the more in-depth maintenance work like the timing belt and valve adjustments, so it would be two for one. Last edited by Samir; January 16th at 10:17 AM. I'm debating on doing my truck "hot rod black" which is basically a matte finish. I've seen a few cars i like but at the end of the day it almost just looks like primer, which is my only turn off. The center stripe and scoop on my hood are painted Hot Rod Black and I love it. I just need to find someone to repaint the blue. Samir why not do a multicolored wrap with HCS logo and maybe some the HCS's sponsors on the car. That's not a bad idea. I'll have to pitch it to the potential sponsors when I talk to them about site sponsorship. It would definitely help offset the cost. I don't know if I'd want to do something so multi-colored though. It would looking like a full out race car without all the body additions, which would be a bit odd. That reminds me, I'll need to get and install the Greddy front lip and Mugen grill before the wrap. Yes, considering i go off road a lot in the truck it just makes sense. I've got the body same as ready to paint and I think i'm about to retire it to street duty for a while so i guess i'm going to actually go with "shiney" paint. Is this the FJ you have in your intro thread or your daily driver? The 70 FJ-40 is in the process of getting restored. When done it will be mint. I have another FJ i'm debating on turning into offroad monster. 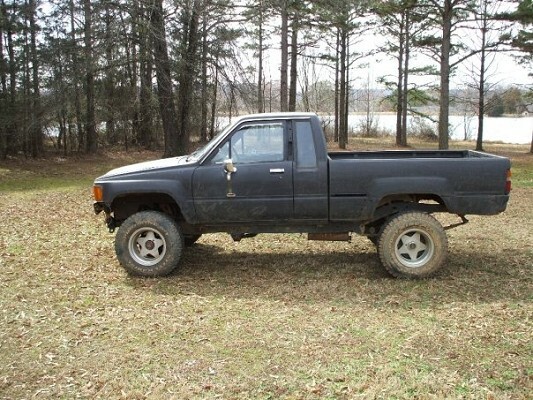 My 86 Toyota truck is my daily driver. I think this would look quite nice in a matte finish. It's got some hard lines that would look pretty cool. I'm pretty sure that toyota is in primer. Even if it's not then it still proves the point that it would always look like it needed to be finished. 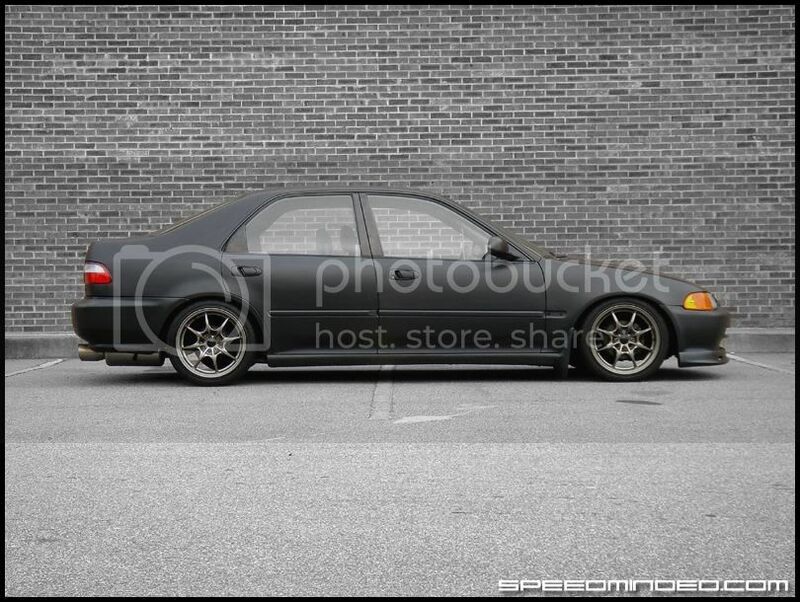 I don't like the Accord in flat black. Looks too much like primer, IMO. Samir, why would u take your car all the way to NC to get the Timing belt and stuff changed out? There are plenty of good and qualified mechanics here in town. Also, why the all of a sudden time crunch on the accord? Don't you have like 300 other cars to drive that would require little maintenance to be drivable? I would go with Paint over Vinyl. Paint can be touched up, waxed, cleaned, etc...I have seen vinyl wrapped cars fade over time faster than a car with paint. If you need someone to do the Brakes and Suspension stuff just let me know. I can have it done in a day and back to you! Those cars above are primer. Any primer is going to fade over time because its ment as a base for paint. Epoxy+Sealer tends to last a while with nice coloring, but ultimatly it will fade also. You could try out some Hot Rod Flatz! Its paint not primer that is specifically formulated for the Matte Finish. They have pearls, metallics, flat, satin, gloss, etc... http://www.tcpglobal.com/kustomshop/ksflatz.aspx its not all that expensive either. No joke..........do a total over haul on a honda in a weekend. They are cake to work on. Samir, why would u take your car all the way to NC to get the Timing belt and stuff changed out? There are plenty of good and qualified mechanics here in town. Not in my professional and personal experience. Clint, my business partner in the 1-800-Radiator distributorship, was one of the finest mechanics I've ever met. He was the lead Porsche technician here in Huntsville and built everything from turbo 600whp Civics to carbureted high-horsepower Novas. He was certified in Ferrari, Aston Martin, Maserati, Porsche, Toyota and General Motors as well as being an ASE Master Technician. What we found is that most repair shops installing radiators and ac condensers did not have properly trained technicians, just 'shadetree' mechanics who have been doing it long enough that the work was acceptable. Clint was shocked as the sheer lack of professional skill in the city, citing that even the worst technician from Greensboro would be better than most here. A perfect example is the situation with my fathers s500. The air ride suspension had a small leak, which caused a drastic change in the alignment of the rear tires. One night returning from a business trip in Florida, a tire blew out. Visually looking at the tire, with 4 of the 5 treads fine and the innermost one completely worn to the point of puncture, it's obvious something is wrong. Both the Mercedes dealership here in Huntsville as well as Birmingham said this is 'normal'. Neither one checked the alignment and just recommended new tires. This car was purchased certified pre-owned so if they would've checked it and found any issues, it just would've been more work for the techs and more money for the dealership. Laziness like this is why every company is trying to outsource to foreign labor. After purchasing new tires and running extensive tests over the course of 6 months, I discovered the problem. Now, I'll probably ship the car to Michigan to a dealership there to have the work done so that it's done right. I'm not going to hand it over to the same numbnuts who couldn't diagnose it in the first place. Forget that. Now, there are exceptions, but I'm not going to risk my cars as a trial and error to find them. People don't even follow the rules stated in the owners manual on how to properly shift an automatic transmission. Forget that, I'm not going to pay someone to mess up my car. I'd rather do the work myself following the official the factory service process, or I'll go where I know the job will be done right if the job is beyond my capability. The Accord runs because of Clint. After the intermediate shaft oil seal popped out and the car sat for 2 years, he's the one who did all the work to get it back to 100%. We've worked on the car since then on holiday breaks when he comes down here to visit in-laws, but this is bigger work that will require him to have a shop and his tools. I've seen him rebuild our Toyota delivery truck motor, and he drove that truck for years as a daily driver. There's no question in my mind that the work will be done right, and that's what I need. Also, why the all of a sudden time crunch on the accord? Don't you have like 300 other cars to drive that would require little maintenance to be drivable? Because I don't want it to get any worse, and if don't get it done in the next 4 weeks, I won't have time to get it done for a year. There are other cars, but as far as drivetrain, this one is the most reliable at the moment. The Altima has a transmission issue as well as an issue with the timing chain tensioner. I'm sure the car will drive another 20k without a problem. But I don't want 20k, I want another 100k, so these issues will need to be fixed. The Galant needs a new head to fix the compression issue, and again that's beyond my expertise, although if I had a shop with a full lift and tools, I'd probably try it. Other cars need more or less, but I want to enjoy those as opposed to just drive them daily and wear them out. I would go with Paint over Vinyl. Paint can be touched up, waxed, cleaned, etc...I have seen vinyl wrapped cars fade over time faster than a car with paint. I did some research on the different vinyls out there. The ones that will fade very quickly are the printed ones. Even the best 3m product will only last 5 years. But a straight color vinyl should last much longer since the dye is part of the product. If it lasts 10 years, that will be good enough for me. You know how this goes--anything that can go wrong will go wrong. So a weekend job for someone else is a week job for me. And when you do things by the book, it tends to take longer as well. I have to plan for every contingency in every single thing I do. If I don't, something somewhere goes wrong. Perfect example was the move to the dedicated host. Because the host didn't remember that the main reason we moved to the dedicated server was for the purpose of adding a ptr rdns entry, after the move every outgoing email was being rejected by email providers. I didn't discover that until weeks later. So instead of fixing the email issue, it actually got worse. And then I had to spend a day researching what exactly a ptr rdns entry is, how it works, what can be messed up, what the email providers requirements are, and make sure the host got it right. It's exhausting, but I can either do this with everything in my life, or just take the losses until I've got nothing left. Sometimes I really want to just give up on everything because of this. Just sell everything I own and just sit in a cardboard box and beg for money. Maybe then life might be easier. I agree. A 'satin' matte finish is more what I'd be thinking, and I think a matte colored vinyl will naturally achieve this effect because of the natural tendency for plastic to be shiny. SkinzWraps based out of TX has really worked hard on the black matte finish. I didn't realize it until I did the research, but they did the work on the c63 amg that I saw on 6speedonline.com. That car was sold to someone in Dubai that had to have it. Looking at their portfolio, they've done some high-end work using what seems like a custom product. After looking more at their gallery, I think I'll give them a call to see what's available. They seem to do top-of-the-line professional work. You do realize i have $hit for luck to right? I do everything by the book as well, however when you have the book memorized it tends to go faster......lol. That and the best tool i have in my shop is my lap top.